I finally took the plunge and bought this drive from Amazon after days of research. What pushed me over to actually make the purchase is after I used it on a friend’s Macbook. I hesitated to buy because I read a lot mixed reviews about SSD. There are two types of SSD. One type is called SLC and the other type is called MLC. There are a lot of info about SLC vs MLC out on the net so I’m not going to try to explain the technical difference between the two. Basically, SLC is the holy grail because it’s fast in both read and write. MLC is as fast as SLC in read but not as fast in write and most of the MLC drives slow down dramatically with concurrent writes. SLC is suitable as a boot drive and MLC is generally not recommended to use as boot drive because of slow write speed and performance degradation on concurrent writes. Also, SLC has longer life than MLC. 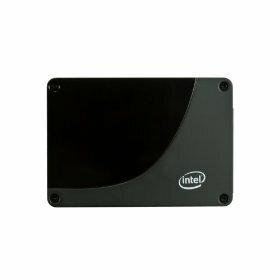 Currently, Intel is the leading vendor that makes a reliable and reasonably fast MLC SSD. Some people commented that Intel’s SLC drive is the only way to go for SSD and their MLC drive is only good for data storage. I have also heard that Intel’s MLC drive is passable as a boot drive. The SLC drive costs almost twice as much as a MLC drive. It’s really out of the question for me to even consider a SLC drive. For me, the 80GB Intel X25-M is the only thing that’s affordable (around $325) with reasonable performance. Luckily, a friend of mine installed the 160GB version on his Macbook so I got the chance to see it in action. I was really amazed by its performance. Photoshop loaded in less than 10 seconds and Eclipse (a Java IDE) loaded in less than 5 seconds. Both Photoshop and Eclipse used to take about a minute to load in the same laptop when it was running on a hard drive. I ordered a 80GB Intel X25-M immediately after testing on my friend’s Macbook. I use Ubuntu myself on a Lenovo Thinkpad X61 (an excellent laptop btw). My boot time reduced from couple minutes to 30 seconds after I switched to this SSD. I’m extremely happy with the performance. Contrary to what some people claimed that the drive would slow down a lot with concurrent write requests, I barely noticed any slow down. Everything loaded instantaneouly. I feel like I missed out a lot for spending the past few weeks doing research on SSD. I should have just take the plunge when the price dropped to $325. If you are still undecided, I say just do it because it totally worth the money. It’s not cheap compare to a hard drive but the performance improvement will sure help in your productivity to make up for it. I have been watching the channel Noggin with my son and saw this cartoon called Max & Ruby. It seems like a fine Kids cartoon at first. But after I saw a few more episodes, I started thinking the cartoon is rather messed up. Max & Ruby is more like a single mom family than brother and sister as what the show suggests. I think it’s even worse for Ruby being a big sister because there are no adults in the family. Is the show suggesting that they are orphans and kids are living by themselves now? Also, Max is drawn a little big for a baby (compare to Ruby’s size). I would think Max is a retarded boy if I didn’t know he’s just a baby. I think this show is probably suitable for baby who don’t understand words yet. For older kids, it’s a little inappropriate. What do you think? Entries (RSS) and Comments (RSS). 34 queries in 0.083 seconds.